On Thursday night The Right Now Crew decided to put it all out there on TheRightNowPodcast. We like to have action on football games, and it's a problem. After a Saturday afternoon of college football upsets and a opening weekend of NFL, I need a cigarette. Two and two heading into the an AFC clash on Monday Night, I've got some 'splaining to do. Miami (Ohio) +37 1/2 @ Boise State My thought was simple. How were the Broncos going to get up for a game against Miami of Ohio a week removed from their huge opening week victory over Oregon? If Boise comes out playing ugly as they did a week ago, maybe Miami of Ohio can put a couple touchdowns on the board before Boise pulls away and puts their foot on the gas. Final Score: Boise 48 Miami (Ohio) 0. Oops. Bronco quarterback, Kellen Moore went 16/26, with 307 yards passing, and 4 touchdown passes. As for Miami of Ohio? Twenty-six carries for 38 yards on the night. For the second straight week the Boise State fans bare witness to a defense that is terrifying. Pitching a shutout to Miami (Ohio) this week and holding an Oregon Ducks team which scored 38 points in a victory on Saturday, to eight points last week, they've proved they are very, very good. Note to self: Stay away. Kent State +21 @ Boston College I should be slapped for this one. A season ticket holder of the Boston College Eagles for three seasons and here I am picking against them in only week 2 against Kent State of all teams. 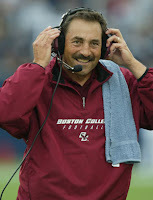 The reality is, Boston College doesn't have a an actual #1 quarterback, they are still working the kinks under center. While they did manage to score 54 points a week earlier in their season opener, this team never puts up points like that, not even when current Atlanta Falcon quarterback, Matt Ryan was under center two years ago. Final Score: Boston College 34 Kent State 7. Again. All I have to say is, win/win. Boston College won by 27 and I have two losses on the book, however Boston College won and as a fan, I'm happy. More importantly, hats off to first year head coach, Frank Spaziani. Injury to senior linebacker Mike McLaughlin, '08 ACC Defensive Player of the year sidelined with cancer, it would be easy for Spaziani and the Eagles to take a mulligan in 2009 but they aren't. Both quarterbacks Justin Tuggle and Dave Shinskie seem to be on the same page as their headcoach, winning is what matters most. Note to self: Don't pick against your team. Atlanta -4 v. Miami (In ATL)The Georgia Dome is a tough place for any team to come and play. The Georgia Dome packed with opening day fans and a quarterback/tight end combination chomping at the bit, well that's just down right unstoppable. The Dolphins were heading into a game that meant something more to Matt Ryan and Co. down in Atlanta. Hoping to have the Falcons first back-to-back winning seasons in errrr well ever and in the process proving that his 2008 rookie campaign was not a fluke. Final Score: Atlanta 19 Miami 7 There we go baby. First win of the season for the Falcons, first win of the week for me. The Dolphins head coach, Tony Sparano was accurate in his postgame press conference, "your not going to win when you don't take care of the ball." The Fish turned over teh ball four times including three fumbles. Respect should be paid to newest Falcon and offseason acquisition, Mike Peterson. The former Jaguar forced a fumble and intercepted a Chad Pennington pass to go along with his seven tackles in his Falcon debut. 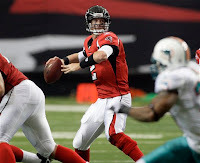 As for Matt Ryan, two touchdown passes with 230 yards passing with zero interceptions. Ho Hum. Note to self: I really don't like the Dolphins this season. Philadelphia -2 1/2 @ Carolina 8-0 at home in 2008, the Carolina Panthers are good at home, right? That was then, this is now. The Eagles were jacked up to get this season under way. 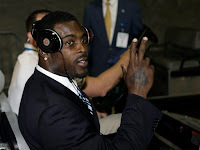 Michael Vick in the owner's box, DeSean Jackson back for his second year, and playing with heavy hearts after the of defensive coordinator Jim Johnson. I loved the Eagles in this one, they wanted to get off to a great start and Carolina would be forced to play up to them. Don't think for one second Jake Delhomme's 5 interception performance during last years playoffs didn't factor into this. Final Score: Philadelphia 38 Carolina 10 Knotting it up. The Eagles score from all over the field, they can get you with special teams, defense, and of course with Brian Westbrook. With all three of those things happening and Jake Delhomme returning to form throwing 4 interceptions in just 17 attempts, you can put that in the book. It's safe to say that Philadelphia will be what we thought they would this season, good and dangerous. Most impressive note, the tandum of Brian Westbrook and rookie LeSean McCoy combined for 22 carries and 110 yards. Not only does Brian Westbrook get to take less carries, he won't be as banged up come November and December. Note to self: McNabb's broken rib aside, the Eagles are a good pick. A 2-2 start for the weekly pick 'em isn't bad. With the Patriots geared up to play in Foxborough against division rival Buffalo, things are looking good. They'll be no excuses for that one, I haven't been this confident since finishing second in a three person foot race. Get after it.